Okay this post absolutely must start off with a photo. 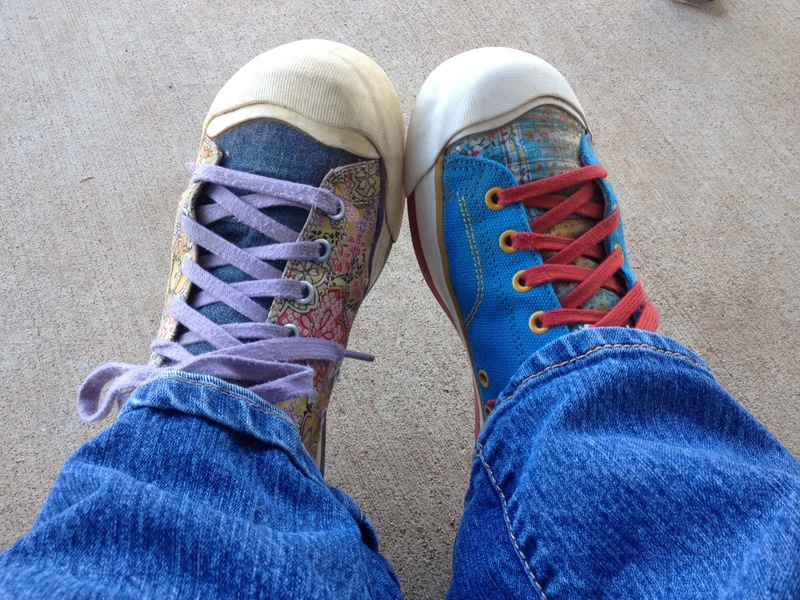 My customized farm shoes, a la Punky Brewster. Yes, these are my shoes, and yes they are on my feet. You see, these are my favorite around-the-farm tennis shoes. However, at one point I did have one of each pair. (I’m not totally crazy). But alas, Maybelle strikes again. Now, for those of you keeping count, Maybelle is getting close to two years old. One would think puppyhood, or puppydom as I’ve been known to call it, would be nearing an end. Nope. Not for our dear, sweet Maybelle. When we had our first cocker spaniel, Madison, I remember reading that the breed could keep their puppy-ness for up to three years and was one of the breeds that took the longest to exit puppyhood into adulthood. Oh how I forgot about this when we brought our little Maybelle home, but oh how my shoe collection is reminding me now. The dog can chew, chew, chew. I feel like I keep Nylabone in business just trying to keep her mouth busy. It’s a good thing she is about as adorable as they come. Anyway, these are now my farm shoes. Great for all those chores like scooping stalls, working in the flower beds, feeding horses, you name it. The million dollar question is will I actually remember I have them on my feet when I decide to quickly hop in the car to run to town to go to the post office or grocery store? I’m praying so, but if I know anything about how my brain works, I am destined to sport this little fashion statement at least once in public. You’ve been warned. P.S. – In case anyone is wondering, the shoes are Keen’s Coronado style. The are my absolute favorites, and unfortunately these lovely fabrics aren’t available right now. But I do keep watching for fun new ones to add.